hot chocolate at angelina's is not at all like typical north american hot chocolate, which used to taste good until i had this. now i don't think i can go back. this is a little like the middle of a molten chocolate cake, but actually better. super thick, slightly bitter, more chocolate than i could handle. so good that i prefer it without the whipped cream. it's a further indulgence to enjoy this in angelina's on rue de rivoli, in their over-the-top pretty dining room. to balance out all that pretty, back to falafel row to test the claims "best falafel in the world". we tried l'as (du falafel) and we wanted to try the rest. turns out the rest are pretty full at lunch time on an average weekday. we found a table at king falafel, a few doors down from l'as du falafel. another hot, fresh, packed with the works masterpiece. 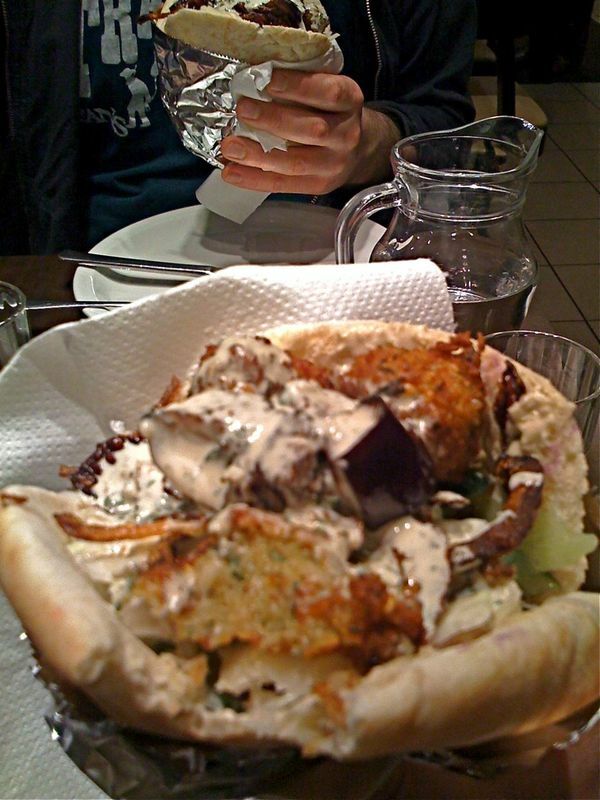 but the verdict…we both still preferred l'as du falafel. I immediately regretted not eating that second falafel as soon as I got on the train.